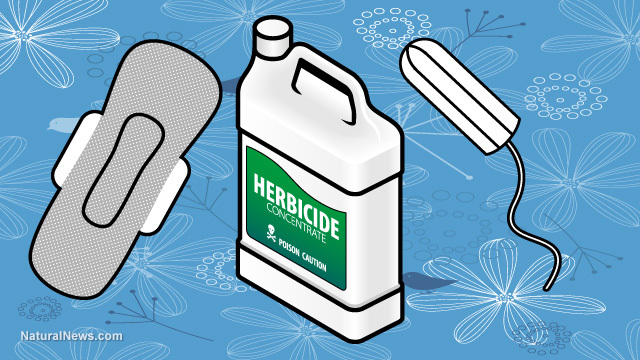 A shocking new study out of Argentina made headlines recently when researchers revealed that 85 percent of cotton-based feminine hygiene products contained glyphosatehttp://www.glyphosate.news/, the primary ingredient in Monsanto's herbicide Roundup. The findings are especially concerning considering that glyphosate was declared "probably" carcinogenic by the World Health Organization (WHO) last spring. Feminine hygiene products weren't the only merchandise to contain glyphosate; sterile gauze made of cotton, as well a cotton swabs and wipes, was also found to contain the deadly toxin, according to Revolution News. "Glyphosate was found in 85% of the products containing cotton bought in pharmacies and supermarkets including feminine care products like tampons and sanitary pads, sterile gauze pads, cotton swabs and wipes," according to reports. "The results of the preliminary study were presented by doctor Damian Marino from Espacio Multidisciplinario de Interaccion Socioambiental (Emisa) of the University of La Plata last weekend. "The study looked at a sampling of products from pharmacies and supermarkets in the area of La Plata, and analyzed cotton swabs, gauze and articles for feminine use. The results from all commercial products detected 85% glyphosate and 62% AMPA (metabolite or derivative of glyphosate). "Almost 100% of the cotton produced in Argentina is transgenic and glyphosate applications are made while the cocoon is open." Dr. Marino, who presented the findings said: "We are starting the process to see what other herbicides are found." "The report left us shocked," said several researchers involved in the study. "We had focused our attention on the presence of glyphosate in food, but did not think the products we use in all hospitals and health centers in the country to cure patients are contaminated with a carcinogenic product. The authorities must give an immediate response to this situation," they said. As Natural News' Mike Adams reports http://www.dreddyclinic.com/forum/viewtopic.php?f=117&t=34669, such a study would "never be conducted in a U.S. university because they've been infiltrated and bought off by Monsanto," which was proven when discredited University of Florida professor Kevin Folta http://www.truthwiki.org/dr-kevin-folta-university-of-florida/ was caught receiving $25,000 in unrestricted grants from the biotech giant in exchange for his devotion to promoting GMOs. According to GM Watch http://www.gmwatch.org/component/content/article?id=12108, numerous reports exist of animals falling sick after feeding on GM cotton. "Between 2005 and 2009 Anthra4, an organisation led by women veterinary scientists researching the impact of Bt cotton on animals in different parts of India, has been closely investigating the reported morbidity and mortality observed in sheep and goat flocks, which have been grazed on harvested Bt cotton crop in Andhra Pradesh. "Despite several reports and representations to concerned regulatory and research institutions both at national and state levels, alerting them to the seriousness of the issue, there has been a persistent reluctance amongst the scientific establishment to respond, investigate and research the core issue."